PHOENIX — A Phoenix-area Republican legislator called on Sen. John McCain to resign from his seat Tuesday if he continues to miss votes while campaigning for president. State Rep. Russell Pearce of Mesa also said he regrets supporting Sen. Jon Kyl during last year's election because the senator now supports a comprehensive immigration bill — though he stopped short of calling for Kyl's resignation. "It's about time we start cleaning house if that's what it takes," said Pearce, chairman of the House Appropriations Committee. According to the Washington Post, McCain has missed 43 votes, nearly 50 percent of the current Congress' votes. In comparison, Hillary Clinton has missed less than 2 percent of votes and Barack Obama has missed 6.4 percent, according to the Post. "We need a senator," Pearce said. "I think if McCain wants to be a full-time candidate and not be at the Senate, he ought to consider resigning." Asked if he would prefer a Napolitano appointee over McCain, Pearce said: "Even poor representation is better than no representation." Wow, so this Republican legislator is saying he'd rather have a Democrat in Washington than McCain. Mr McCain, you may have a home base problem. Hint: Go visit your peeps some more. In fact, You may remember some guy named Bob Dole resigned his Senate seat to run for president--if you can't make it back to vote once in a while...well, it's just a thought. McCain should resign or be fired! This makes Kerry look like a hard worker in 2003/2004. If he'd fulfill his promise to commit suicide, he wouldn't have to resign. The Straight Talker has been playing too much hookie. Can taxpayers pro-rate his salary based on attendance? McCain, a good man who served our country well. 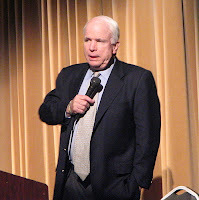 Age and dementia will catch up to all of us sooner or later, I'm afraid that in the game of 'TAG', John McCain is 'it'. He is clearly delusional. Russell Pearce is a reich wing Mormon wacko from Mesa. He is a brownshirt, goose stepping fascist. Pearce supported both Mc Cain and the horrible John Kyl but he is even more reich wing than they are. I hate to admit it, but he is right on this issue. Pearce is a flat-out racist. He actually thinks we're going to be in a war with Mexico, that people are not coming to the states for a better life, but to take over the country. White supremacist sites idolize him. If I showed up to work only 50% on the times, especially the most important times, I would be fired.